Today I flew my plane home from Waterloo to Ottawa with a brand-new autopilot installed. I’ve flown over 850 hours, about 120 of them in actual instrument conditions, and all by hand. I’m proud that I can do that, but at the same time, it’s tiring: after 8 hours bumping around in cumulus clouds and dodging storms on the Stormscope, I’m exhausted beyond anything I’d ever imagined. Even 4 hours in good VFR weather can be tiring, because of the constant attention needed to keep the plane straight, level, and on course. I knew it was time to improve rather than just maintain my plane, and I also considered an IFR GPS and a new paint job (both about the same cost), but the autopilot gave me the biggest safety and operational benefits for the money. I called a few places for quotes, but the only one that answered my calls and questions consistently was Kitchener Aero, where owner Barry Aylward went out of his way to carry on a friendly e-mail and phone correspondence for half a year while I hemmed and hawed, then fit me right in as soon as I made up my mind, as if I were one of his bizjet customers rather than a tight-fisted Cherokee owner. 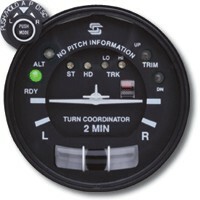 I decided on the S-TEC System 20, a rate-based autopilot (much smoother and more reliable than old APs) that is built into a turn coordinator, and replaces that instrument on my panel without needing any extra space. The S-TEC 20 is a single-axis autopilot — that means that it controls roll (and heading), but not pitch (and altitude) or yaw. Barry warned me that I’d wish I’d paid a few thousand extra for the S-TEC 30 with altitude hold, but I was already close to my spending limit, and knew I’d end up asking for extra maintenance work on my existing avionics (and a new 406 MHz ELT, since the plane was there anyway …). Keep the wings level, and allow simple, stable turns using a knob (without risk of overbanking). Track a heading set on my heading indicator. Track a VOR radial inbound or outbound. Track a localizer on a LOC or ILS approach. We were able to try all of these during the test flight northwest of Waterloo (except for the LOC tracking, due to a miscommunication with Waterloo tower). Unlike GPS tracks, VOR needles tend to scallop — wag back and forth — and an autopilot that overreacts to that will soon make the passengers (and pilot) seasick with all the rocking. The S-TEC 20 responded very gently, and almost unnoticeably, to the scalloping, even close to the VOR. During my flight home, I had a chance to use both modes for a bit over two hours. I used VOR-tracking mode to track northeast outbound from Waterloo, then heading mode (with frequent adjustments) to fly a DME arc just outside Toronto terminal airspace until I could join my airways, then back to VOR-tracking mode as I followed the airways and switched from VOR to VOR. Up at 9,500 ft, above the broken layer of cumulus cloud, the air was smooth as silk, and I was able to fly hands off with only an adjustment every 5 minutes or so to the elevator trim to hold altitude. Barry was wrong — I wasn’t missing altitude hold at all. Unfortunately, summer is summer, and eventually, the cloud layer rose up to meet me. I had to descend down below it, and my nice smooth flight became a mechanical rodeo bull. The autopilot still did a good job holding heading and tracking the VORs, though the turns in turbulence were more aggressive and noticeable, but I found myself trimming every 30 seconds or so as my pitch and altitude shot up and down in rising and falling air columns. Barry was right — in the turbulence, I wished I had altitude hold. The good news is that the S-TEC 20 can easily be upgraded to an S-TEC 30, which does support altitude hold and electric trim. Maybe in a year or two. I think the autopilot is going to be a big part of my flying from now on. I’ve enjoyed the bragging rights of always hand-flying, but 9 years of bragging is enough. Besides, if flying is less tiring, maybe I’ll do more of it, and travel further: the prairies, the Arctic, the Mississippi, even the Florida Keys and the West Coast are all out there waiting for me. This entry was posted in General and tagged avionics, maintenance, owning. Bookmark the permalink. Congratulations. I have a 1969 Piper Cherokee 235 with a STEC 30 auto-pilot. I just had it painted and understand very well the balancing act of deciding what “needs” an upgrade. Enjoy the summer weather and the new auto-pilot. awesome! Glad you’re enjoying the AP. Does this change any of your personal limits at all? For example.. would you consider flying in something more challenging (weather wise) now that you have a second set of hands on the yoke? KC: thanks for the comment. How do you find the S-TEC 30’s altitude control? In an underpowered, 160-hp PA-28-161, I’m concerned that I’ll see my airspeed fluctuating wildly in thermals. Blake: thanks. I don’t think the AP will change any of my personal limits, except perhaps letting me fly more longer trips with less fatigue (e.g. maybe Ottawa to Winnipeg or Newfoundland in a single day). Currently, the main things that force me to cancel a flight are icing, low surface vis, or too much CB. Glad to see you update your blog… it had gone quiet for a while and I was wondering about you. Your blog has greatly influenced me. I was leaning toward the Cherokee family when I was looking for a plane, but your blog really convinced me that I wasn’t crazy to be considering a “trainer” like the Warrior 2 for personal family transport. Last month we bought a Warrior 2. Very nice plane for the small family…. big enough, economical to operate, and much nicer to fly longer distances than the Skyhawks I trained in. My “new-old bird” sports the Piper-badged wing-leveler A/P made by Century. Been there since the beginning. I am just a visual pilot now (again your blog has motivated me to do my IFR later this autumn), but I already love my A/P on the x-countries. My A/P can be driven by the VOR/OBS or by the Apollo GX60 GPS. Altitude hold would be nice sometimes, but like you say trim works really well in smooth air. This morning I flew A/P for at least an hour. After I trimmed altitude, the old Warrior would hold +/- 50 feet with nearly zero input from me. Happy flying and keep blogging. JW: I’m glad to hear you’re enjoying your Warrior II — it’s a surprisingly capable plane for a low-end trainer. My children are adult-sized now, but when they were still kids and tweens, I could take all four of us, plus baggage, plus the dog, plus full fuel 450+ nm with IFR reserves. We flew to Cape Breton, Halifax, Gaspé, New York City, Boston, Toronto, Sault Ste. Marie and many other places, and I’ve taken it as far south as Washington/Dulles for business. Now that they’re older, I find the plane is great for visiting my older daughter at university (1.5-2 hour flight, vs 4.5-5.5 hour drive) or giving her a lift home, for taking my younger daughter down to Boston for Red Sox games, and still, for Hope Air flights whenever I can fit them in. As gas gets more and more expensive, I love that the plane burns only around 7 gph at full cruise power when flying LOP/WOT. Sorry if I missed it, but how much did adding the AP cost? Great write up on autopilots! I am a new instrument student working toward my IR and planning to purchase an airplane. Do you recommend adding an autopilot like STEC 55X versus an IFR GPS as part of the training or should I hand fly instruments a while before adding an autopilot to training and the check ride? That’s a hard call. I flew for almost 10 years without an AP, and I appreciate the skills I learned doing that, but at the same time, if you can afford it, it never hurts to have an extra safety option on board. Just make sure your instructor integrates it into your IFR training, including dealing with failures. Hi David, I came across this blog as I have an Stec 30 that’s broken, and I’m doing some research before getting it fixed. At any rate, I see that you and I have something in common. We both have the Arctic, Mississippi and west coast on our aviation bucket list. Your blog was written a few years ago, so I’m wondering if you’ve managed to fulfill any of your adventures. I’m planning a trip this summer: option 1 is Mississippi (the whole of the southern U.S.) and option 2 is the Arctic. I can’t really afford either, but considering I just spent a cr@p load on an engine, prop, and governor overhaul, I might as well make good use of the airplane, while fulfilling at least one lifelong dream. If you have advice on either I’d really appreciate it. I made it out to Winnipeg, but none of those 3. Arctic is a challenge because avgas is rare — you have to try to arrange to buy barrels from band councils and hand-pump it, from what I’ve heard. I’ve been very happy with my STEC 20, especially because it’s independent of the vacuum system, and can still help me keep the wings level if I’m partial panel. However, there have been a series of new, affordable autopilots released in 2017—from Garmin and others—that add a lot more functionality for the same price. I’d probably look at those first now, since you have the advantage of a few years of progress.